Negribreen, one of the largest glaciers in Svalbard, is currently surging with maximum speeds reaching 22 metres per day in July 2017. That is an acceleration to about 200 times the normal flow velocity of the glacier! 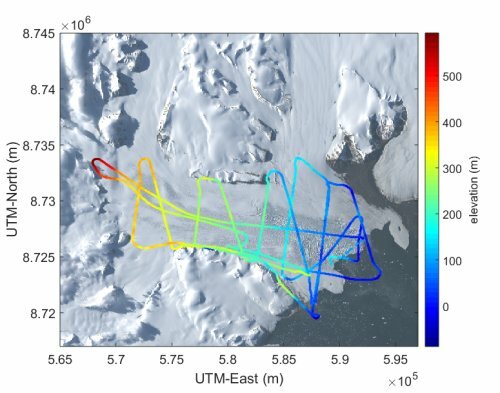 The SIOS access project ' Negribreen Surge' investigates this fast movement and its implications for the glacier using satellite data combined with field data. Such knowledge is needed to better understand the role of surging glaciers in the Arctic System and global sea-level rise. 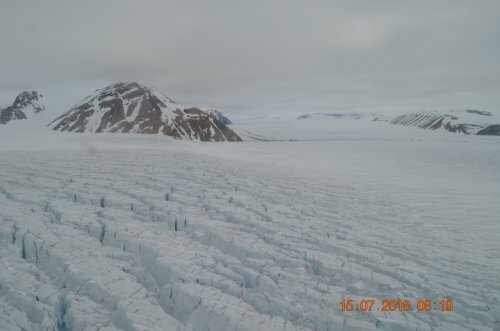 The objective of the SIOS project "Negribreen Surge" is to collect geophysical data over the glacier system and investigate the surge phenomenon. Specific objectives concern dynamics of the surge, surge progression in the Negribreen glacier system, crevassing, ice-ocean interaction, mass loss and mass balance, and generally ice fracturing and glacial acceleration. Methods include elevation and velocity data analysis, classification of surge crevasse provinces, modeling of ice fracturing, and investigations of ice-dynamic processes through data analysis and numerical experiments. Broader topics are the comparison of surges in cold-based, polythermal glaciers with those in warm-based glaciers in observations and modeling. Lastly, understanding surging and non-surging glaciers better will fill a gap in our understanding of the Arctic System and reduce the uncertainty in sea-level-rise assessment. In 2018, the researchers have added an objective to evaluate satellite laser altimeter data of NASA's upcoming ICESat-2 Mission (launch planned for September 12, 2018), funded by NASA Earth Sciences. The associated Research in Svalbard project is RIS-ID: 10827 Negribreen Surge. The project was lead by Ute Herzfeld from the University of Colorado, Boulder, USA. Here is their report from the field! Photo: A surge crevasse field of Negribreen. Notice the increased surface height of the surging ice of Negribreen, compared to the slow-moving, non surging ice of adjacent Ordonanbreen. Photo by Ute Herzfeld. Negribreen is a so-called cold-based glacier, which means, it is frozen to its bed and normally moves rather slowly - on the order of meters per year, not meters per day as during the surge. In order to surge, the glacier needs to decouple from its bed. In contrast, glaciers in warmer climates, for example, in Alaska, flow on a layer of water that is above the pressure melting point, and typically has some sediment mixed in. Because Svalbard is geologically composed of sedimentary rocks in many regions, and definitely in the region of Negribreen, one expects that the bedrock below Negribreen is also of a soft, sedimentary type. To study the first surge of the glacier since 1935/36, we collected airborne geophysical observations over Negribreen: Laser altimeter data, image data (GoPro time-laps data), GPS data for geolocation of the laser altimeter data and the image data, and, of course, many photographs, which are also GPS-referenced. The 2017 work was funded by the U.S. National Science Foundation. Photo: The team in 2018: Landed! And we fulfilled all our Objectives! Left to right: Tom Trantow, Connor Myers, Tor Andre Valsdal, Ute Herzfeld. Photo by Gunnar Nordahl. The objectives of the 2018 observations were to investigate the progression of the surge process and to establish a geodetical framework for ICESat-2 validation in 2019 (launch September 2018). We were able to use the helicopter chartered by the Norwegian Polar Institute (NPI) - many thanks to all involved. 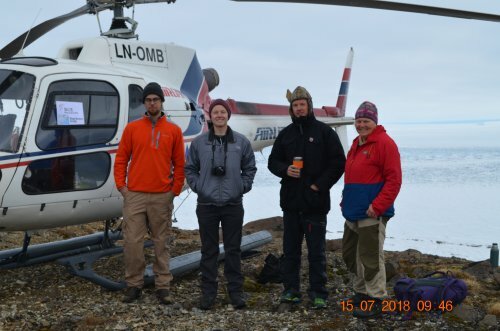 Obviously, our work would not be possible without the helicopter of Airlift AS and its great pilot(s) and technician - Anders Bjørgum (2017), Tor Andre Vaksdal (2018) and Gunnar Nordahl (2017 and 2018) - and the logistical help of the two Chief Logistics Officers of NPI, Håvard Hansen (2017) and Harvey Goodwin (2018). Some first results from flight 2 are shown below. Figure 1: Flight paths over Negribreen, coloured by glacier elevation. 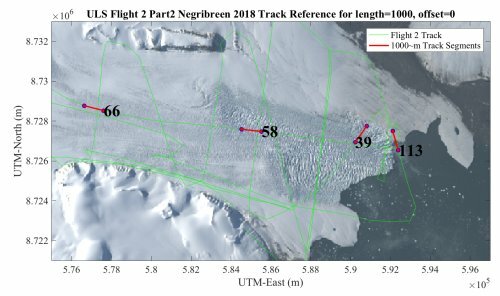 Figure 2: Track Reference of selected tracks flown by helicopter over Negribreen - results shown in figure 3. Figure 3: Heights of glacier surface measured by Universal Laser System (ULS). For track references see figure 2. The project team would like to thank SIOS for support of our project, especially Heikki Lihavainen, SIOS Director, and Inger Jennings, SIOS Logistics Officer; Håvard Hansen, Harvey Goodwin, Christian Zoelly and Jack Kohler at NPI and Sebastian Sikora, Dag Furberg Fjeld and Audun Tholfsen at the University Centre in Svalbard (UNIS), for logistical support; Jorge Kristiansen (Reception UNIS); Anders Bjørgum, Tor Andre Vaksdal and Gunnar Nordahl, Airlift AS, for flight operations; Captain and Crew of RV LANCE for flight operations support in 2017; and Joe Pettit and Spencer Niebuhr, UNAVCO Boulder.